Happy Mother’s Day! And happy first recipe. I heart you for reading this post! Just an FYI, I don’t pretend to be a nutrition or fitness expert – I’m just a Vegas chick who who never stops thinking about food and how to look good in a bikini at the same time. I’m just hoping I can entertain those of you who are into nutrition fun facts, vegan curious or bi-curious, or on the lookout for recipes that taste awesome and won’t make you fat…because that’s ALL I WANT! I hope everyone had a fab Mother’s Day! My mom’s been in town from The OC and we’ve been running around Vegas watching Elton John, Jersey Boys and eating our weight in guacamole – goodtimes! We also ate veggie burgers from Sugar Factory and avocado tacos from Border Grill that were super delicious and vegan approved (with some no-dairy requests.) My mom follows a pretty strict no sugar, dairy or wheat diet for her migraines, and I peer pressured her into watching Forks Over Knives so I think now she might be on the veggie train back to So Cal. Fun fact – my mom only drinks tequila. She drank a lot while watching the doc so I think that means she liked it! 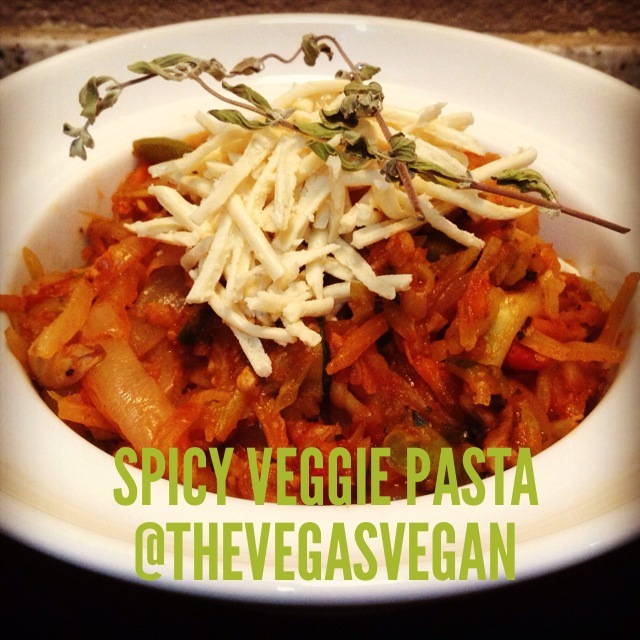 Here’s a recipe for some spicy veggie pasta! Not gonna lie, I could probably eat this entire portion in one sitting but I know you’re all civilized people so I’m going to say it serves 2-4 and try to learn some self control. Also, try not to mandolin your finger like I did, because that’s not vegan. Add zucchini & sweet potato “noodles,” broccoli & carrot slaw, mushrooms, garlic, salt & pepper and red pepper flakes and stir well to combine in the pan. Cover and cook on med-low heat for 10-15 min until noodles are cooked through, stirring occasionally. Stir in marinara sauce, then simmer on low while covered for another 5-10 minutes. Top with vegan cheese if desired, cover until melted.